MAXQDA allows you to import data directly from Twitter into an open project and to analyze it using MAXQDA’s usual functions as well as the specific analysis tool. With a complex search, you can search for tweets on Twitter according to specific hashtags, usernames or terms, and then import them into a MAXQDA project. The function’s special feature is that it can code your Twitter data automatically with up to 100 author names and up to 100 hashtags during import (and, if necessary, later). This automatic preparation can save a lot of time, which you can then use for your actual analysis. What did a user, user group or company post at a certain time? What were other users reaction to its content? Which are the most common words used in the tweets? How many followers do the people tweeting about particular topics have and what is the reach of individual tweets? On which weekdays and at what times were tweets on certain topics written? Please note: To use this function, you need your own Twitter account. To import twitter data, go to Import > Twitter Data. 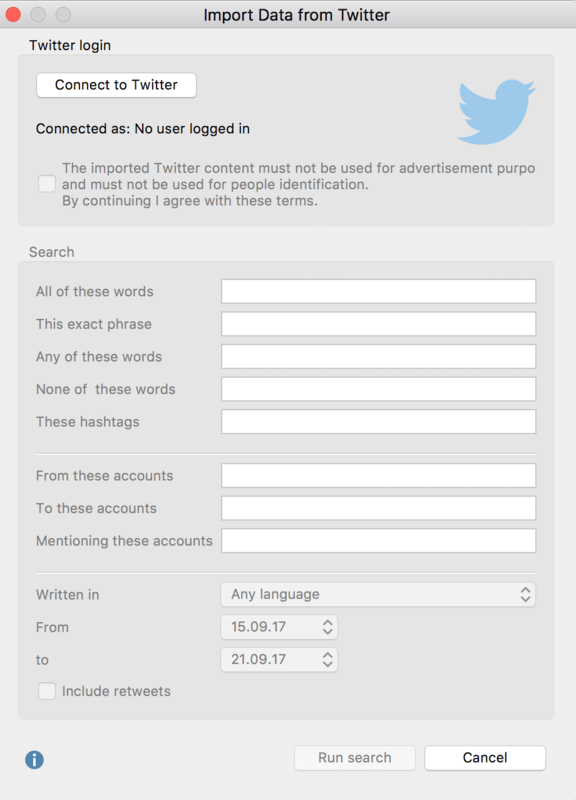 A new browser window will open where you can enter the login data of your Twitter account. Then, click Authorize App to allow MAXQDA to receive Twitter data from your account. After registration, you can close the browser window and return to MAXQDA to start importing data. 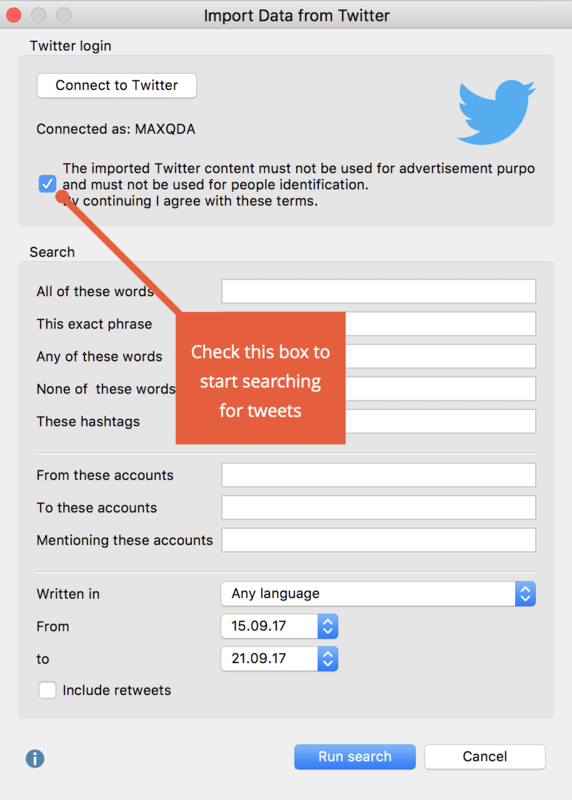 Please note: MAXQDA uses the connection to Twitter only for importing tweets. When you close MAXQDA, the connection will be cancelled, meaning you must reconnect to Twitter each time you restart MAXQDA. The original dialog window that you opened in MAXQDA will remain open, indicating whose account is connected to MAXQDA. You can now check the box below the login button, which was previously greyed out. Only once you have agreed to the terms of using Twitter data neither for advertising purposes nor for personal identification can you start your search on Twitter. Once you agree to the terms, the search fields will be-come available. From these accounts – searches for tweets from specific users. Multiple usernames can be entered, separated by commas. To these Accounts – searches for tweets in which the entered username appears at the beginning of the tweet. Multiple usernames can be entered, separated by commas. Mentioning these Accounts – searches for tweets in which the entered user name appears somewhere in the tweet. Multiple usernames can be entered, separated by commas. Language: Limits the search to the selected language (the assignment of tweets to a language is done by Twitter itself and is not verified by MAXQDA). If you wish for tweets in all languages to be taken into account, allow the default parameter “Any language” to remain. From/to: The default search period is set at seven days, becuase this is the maximum period allowed by Twitter’s search function. You can reduce the search period, for example to one day, by adjusting the dates accordingly. Please note: All search criteria are linked with the search operator AND. This means that only tweets that meet all of the conditions entered will be retrieved. After clicking the Run Search button, a preview window with the first 100 search results will appear. The number of tweets found is displayed on the lower left. When more than 100 search hits are found, the display is updated approximately every 10 seconds. 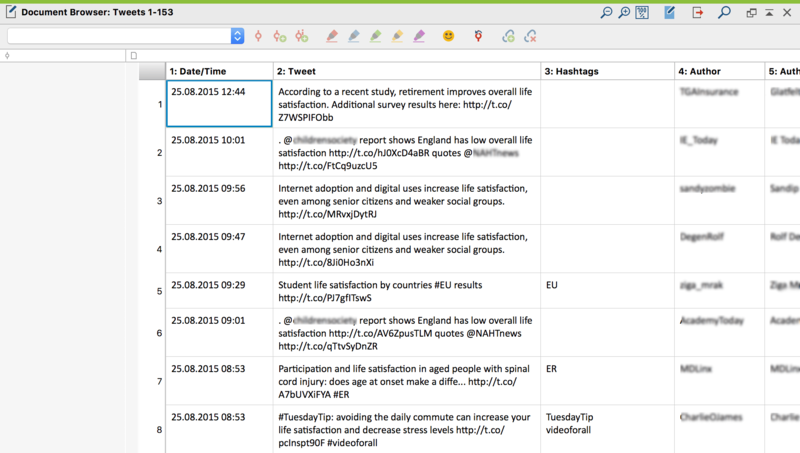 When you click Import data, MAXQDA will begin the importing the tweets. Please note: Imports are limited to 10,000 tweets. Immediately after import, a dialog window will appear with the functions for autocoding tweets. 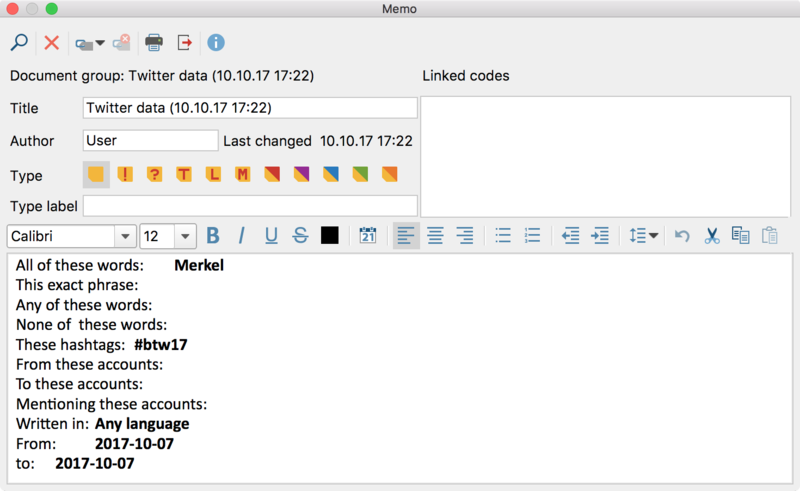 During the import process MAXQDA creates a new document group in the Document System, in which a table document is generated for every 1,000 tweets.